Just in time for the Olympics and a season of worldwide patriotism, Lacoste has debuted their 2012 polo flag collection. 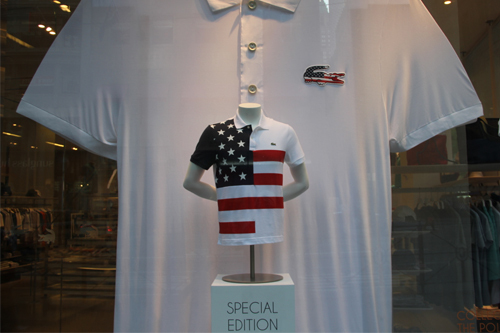 Inside their Fifth Avenue windows, larger-than-life polo shirts stand erect. The United States, Brazil, China and the United Kingdom are just a few of the countries featured in two shirt styles. For a twist on the original, the iconic crocodile is dressed up to represent each country and for a bold statement, the flag is the hero of the shirt. Check out the entire collection at Lacoste.